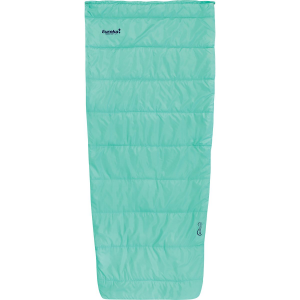 From a camping trip in Vermont to sleeping out in the backyard with the family, the Eureka Women's Kiewa 40 Degree Synthetic Sleeping Bag's tapered rectangular shape features a low profile, 3D footbox with a full-length zipper for a variety of uses. The durable yet lightweight polyester taffeta shell fabric is built to last, while the peached polyester lining gives you an extra cozy night's sleep every time you slip into the bag. A full-length, insulated zipper draft tube defends against cold air sneaking in, and the anti-snag guard helps keep frustration to a minimum. Plus, an internal pocket gives you a safe stash spot for your phone, headlamp, or map for quick and easy access in a pinch.